Channie's Visual Handwriting & Math Workbooks offers a variety of print, cursive and math workbooks for elementary students. My 8 year old needs to learn cursive, so I was happy to review Easy Peasy Cursive, which looks unique and helpful. Channie's workbooks were specifically developed by Chan Bohacheff for her son who had handwriting struggles. 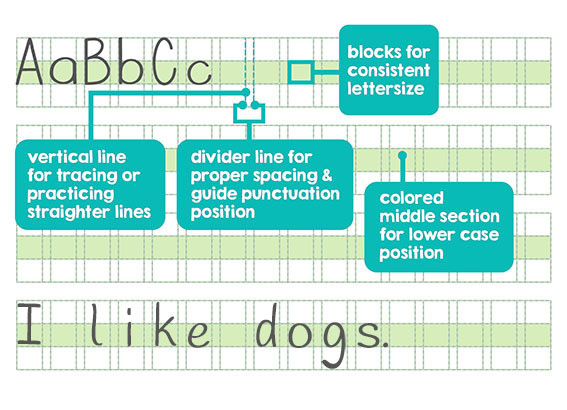 The books are unique in that they offer a more visual representation with vertical dotted lines and colored blocks in order to assist with proper letter formation, sizing, spacing, and even punctuation. Although the books were developed for children with difficulties writing, I believe they are suitable for children of all abilities. Beginning writers, struggling writers or those who just need review would all benefit from this. The cursive book has 80 pages, and focuses on introducing the alphabet. The book teaches the letters in alphabetical order, teaching both the capital and lowercase version together. Each letter has a few pages of practice. The first page has the guided arrows for tracing. There is not a sample with the letter broken down into steps, which would be beneficial for some of the letters with more loops. I always model the letter first, so he knows which direction to loop, otherwise he sometimes tries to lift his pencil or loop in the wrong direction. The second page has more practice for the same letter without the arrows. Finally, there is a blank page to practice writing the letters without tracing. We follow the Charlotte Mason method, which means we need short lessons, and he should focus on creating a few beautiful letters over many mediocre letters. The way this book is set up works well for our needs. There are 5 lines on each page, so I have him do a line or two for each letter, then move on to a new page the next day. There is no cumulative practice built in, so after a week or so, I have him go back and do a line from a few previous letters. Sometimes I will instruct him to use one of the blank pages to also write out the letters he knows to that point. The end of the book has one page, front and back, with words to write and copy. I wish there were a couple of pages like this built in throughout the workbook, using learned letters, so there would be more practice with connecting letters. I think it is often very effective to put a new skill into practice, but the blank pages can be used for this too, as long as the parent provides a good model first. Or, perhaps, there should be a book two! So far, Emory is enjoying the workbook, and his letters are turning out well for being completely new to cursive. He likes to look over his row of letters and circle his very best sample, especially on days where he's writing the letters independently. I am please with the results we are achieving. Also check out their Facebook page!